Because I've Been Asked...My Talk on "Supporting Your Husband In His Priesthood Calling"
Last summer, I gave a talk in church. I was assigned to speak on supporting my husband in his priesthood calling. Ignoring the fact that I’d love to see something about how husbands should support their wives in their endeavors, and brushing aside my annoyance that this was an effort to bring me not-so-gently away from feminist ways, I prepared a talk that features my favorite scriptural hero, Deborah. Never heard of Deborah — which I find sad. A few years ago, one of the last times I was in a Relief Society meeting, the teacher had each of us name a favorite prophet. While everyone else picked old men or dead men, I named Deborah. No one had heard of her in that meeting, either. I think it’s too bad that we’re all taught about male role models, and we don’t have a range of female role models. And those we have are watered down these days, softened to fit roles assigned by gender (Eliza R. Snow, anyone?). Wanted a copy of the talk. I thought it was somewhat subversive when I first wrote it (at least many of those who think that Josh needs to get his wife under control would think it so, if they hadn’t been sleeping through Sacrament meeting), but I can already think of ways to make it even more subversive. And I really think that I’d change some things because some of the terminology I used and some of the sentiments I expressed don’t really reflect my true feelings. But we all have to remember the audience at some point. Since my primary days, my favorite Scriptural role model has been Deborah. When I was assigned to speak on supporting my husband in his Priesthood callings, turned to the story of Deborah for inspiration. Deborah’s story can be found in the fourth and fifth chapters of the book of Judges in the Old Testament. 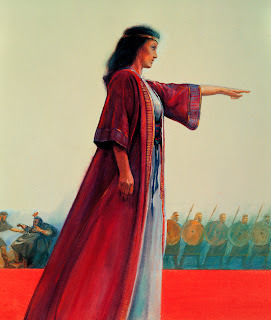 She was a prophetess who served as a judge in Israel. At the time, the Israelites were oppressed by a Canaanite king. The Lord had called a man named Barak to lead an army against the Canaanites. He was a little slow to heed the call. Deborah called Barak to see her, and reminded him of his duty to the Lord and the people of Israel. Barak agreed to lead the army against the Canaanites, but only if Deborah came with him. Deborah agreed, and the Canaanites were vanquished. Even though the Bible indicates that Deborah’s husband was another man, we can still learn about how to support our husbands in their priesthood callings from the interactions the prophetess had with Barak. Deborah’s support of Barak’s calling from the Lord had two parts. She reminded him of his duty, and she went with him as a partner. As wives, can support our husbands in their Priesthood callings by behaving in a similar manner. We can remind our husbands of their duties. There is a publication that the Church puts out titled, The Latter-day Saint Woman: Basic Manual for Women. The manual suggests that we encourage our husbands to fulfill their callings in the church. Smith’s Bible Dictionary points out that Deborah had the power of prophetic command. She could essentially tell Barak what the Lord wanted him to do, and remind him, bluntly, of his calling. Of course, Deborah wasn’t Barak’s wife. As wives, our reminders to our husbands should probably take on a different cast. We can offer gentle reminders of meetings, and ask our husbands if they are planning to participate in an upcoming quorum activity. We can offer encouragement when our husbands attend church meetings and activities, go home teaching, or prepare lessons. Rather than complain when our husbands are out serving the Lord through their church callings, it can help to be cheerful. When we lived in Syracuse, New York, my husband often accompanied the missionaries on splits. I enjoyed seeing his enthusiasm for the work. While I sometimes missed him in the evenings, I tried not to complain about his absence because I knew he was doing important work. Besides, we want to be supported in our own endeavors to fulfill our callings. It only makes sense to support our husbands as they work to fulfill their duties. The manual also suggests that we ask for blessings when we need them, providing our husbands with the opportunity to call on the power of the priesthood on our behalf. My mother set a great example of supporting my father in his priesthood duties. The night before I married, my mom took me aside and suggested that I ask my dad for a blessing as I embarked on this new phase of my life. Her influence prompted my request, and the resulting blessing reminded me that my Heavenly Father is mindful of me. I have also had the opportunity to request blessings from my own husband, and have been glad that he has always been willing to fulfill his duties in that manner. Asking for blessings, and encouraging our children to ask for blessings when faced with new challenges and new experiences, can be one way to express confidence in our husbands. Another way we can remind our husbands of their duties is through example. We don’t always have to tell them to fulfill their callings. In fact, few of us like to be nagged. You can’t force your husband to do what you think – or even know – he should be doing. We all have agency, and belaboring the point in an effort to compel your husband to do his duty can only result in hard feelings. While this passage was aimed at those ordained to offices in the priesthood, it also applies to those of us who plan to support our husbands in their callings. Rather than nag, it’s possible to set an example by the way you magnify your calling in the church, and the way you fulfill your responsibilities. Whether it’s regular temple attendance, completing your visiting teaching, or attending your own meetings, you can set an example that is of use to your husband – without the need to tell him what he should be doing. Set an example, and follow the counsel of the Prophet Joseph Smith. He said women should concentrate their faith and prayers for their husbands. He said that wives should “sustain and arm” their husbands with their prayers. It seems like a relatively small thing, but showing confidence in our husbands, and praying for them, can be one way to support them in their priesthood callings and duties. We can go with them. Just as Deborah agreed to go with Barak to provide her support and partnership in his endeavor, we can support our husbands by acting as partners with them, and working with them, as they fulfill their priesthood duties. While the Proclamation acknowledges the need for individual adaptation to circumstances, it is clear that in a two-parent home, where there is a husband and wife, a partnership exists in all things. As women, we need to be like Deborah and hold up our end of the partnership. Some of the ways the manual suggests that women develop themselves so that they are better able to support others in their endeavors include learning of Jesus Christ, praying, and being anxiously engaged in a good cause. An oft-heard piece of advice is that you need to take care of yourself before you can take care of others. In the Church, this reality works a little differently than in the world. A wise Institute teacher once explained that the way we take care of ourselves first is to turn to the Lord and to boost our own faith. When we turn the Lord, He can then fill us with His love for others, and we are better able to support the people in our lives that need it. This includes our husbands, and our ability to support them in their priesthood duties and callings. As you take care of your own spiritual needs, working to build up your faith, you will be better able to support and uphold your husband in his priesthood callings. Deborah supported and upheld Barak in his efforts to fulfill the calling of the Lord. As a result, the people of Israel were freed from oppression. I have a testimony that, as wives, we can support our husbands in their priesthood callings and that our support can make a spiritual difference in our families. That was a great talk, I would have squirmed a bit as well if assigned that topic but you handled it well. I really don’t think that it was subversive, and any one who would think it was probably has issues.